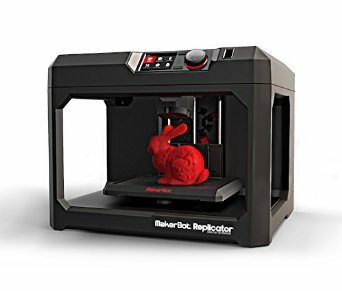 The MakerBot Smart Extruder is “smart” in many areas, but they still can not find a clog and then subsequently unclog it by themselves. We are probably still a few generations of printer away before these extruder’s can be completely automated when it comes to self-diagnosis and repair. So how do you fix a blockage? To combat a passive learning culture, at the beginning of last year we implemented the concept of a Learning Project at our College. The concept of the Learning Project is to move Professional Learning in a direction that is relevant to teaching staff’s individual interests, contexts and passions. Similar in concept to Google’s 20% time, each Tuesday afternoon, instead of traditional meetings, priority has been given for Professional Learning and Learning Projects. Each week during this time, a series of short workshops on a range of topics are offered by our staff that other staff can attend. These sessions are “opt-in” and are not compulsory, however if you don’t attend one of those sessions it is expected that you are engaged in either an individual or collaborative learning project. The big idea or driving question is explored over the course of the year. Documentation collected as part of a staff members Learning Project varies in form from a research paper, a short video, a unit of work, data analysis that yields an interesting or unexpected result or it could be as simple as the sharing of a powerful “light bulb” moment. Staff then present their progress on their learning project during our staff learning day at the beginning of term four each year. Progress is the key point here. There are no hard deliverables as we understand that trust and the process are as important as the end result. Any change initiative is always met with pockets of resistance, as anything new challenges the status quo and induces an anxiousness or fear response from the “amygdala hijack“. What this model of professional learning has achieved in a relatively short period of time is shift the dominant dialogue from low-level administrative matters to learning. Staff have been invited to be active participants in their own learning. A large majority have risen to the challenge. In a world of accelerating change, traditional hierarchies are often too slow to change direction. Kotter in his book Accelerate: Building Strategic Agility for a Faster-Moving World, advocates a new system—a second, more agile, network-like structure that operates in concert with the hierarchy to create what he calls a “dual operating system”—one that allows organizations to capitalize on rapid-fire strategic challenges and new directions. The hierarchy and the network coexist to drive efficiency and innovation. This second operating system or network-like structure mimics successful enterprises in their entrepreneurial phase. Networks are more agile because bottlenecks don’t exist and you have many people driving important change and from everywhere. Its a distributed leadership model. The two systems work as one with a constant flow of information between them. Whilst traditional hierarchies are built to minimize risk, these “accelerator networks” are free to take risks and innovate. The hierarchy doesn’t manage the network, rather they work in synergy. Essentially you create structures that can short circuit the way things have always been done. An essential ingredient of change. Kotter, a leadership and change management expert, advocates eight accelerators to accelerate change within an organization. This year we have emulated some of Kotter’s work and created some “accelerator networks” around the three key areas of Innovation, Pedagogy & Assessment. By establishing urgency, opening membership on these networks to all and establishing some big opportunities around key themes, we have seen innovation come from everywhere and change accelerate. 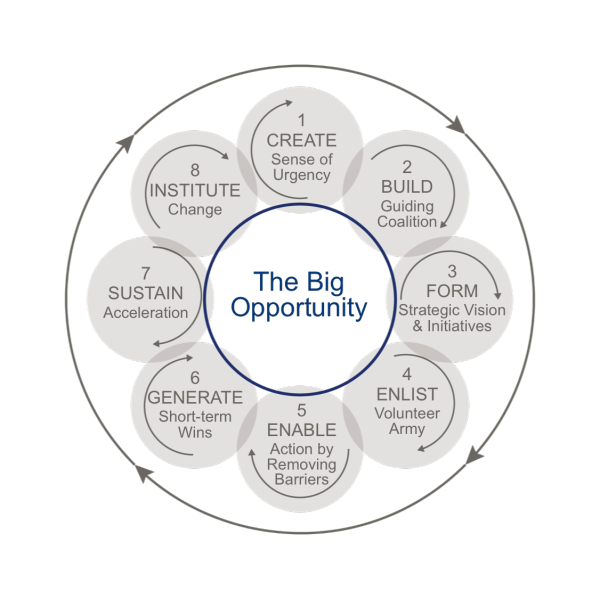 Whilst there are quite a few reasons for this, these “accelerator networks” in particular have caused a shift to immediate action by creating a distributed leadership platform for us to discuss and implement organizational change in synergy with the traditional hierarchy. Steve Collis from NBCS was recently talking about this exact idea at DigiTech By The Bay. John Burns is doing the same with his HackSIS event where he is inviting people to create, design, break, reverse engineer & reimagine facets of their school community by posing big questions that create opportunities. There are many change management frameworks around but I think Kotter’s is a good one.